I thought the title might get people thinking it was a really juicy topic. hahaha! 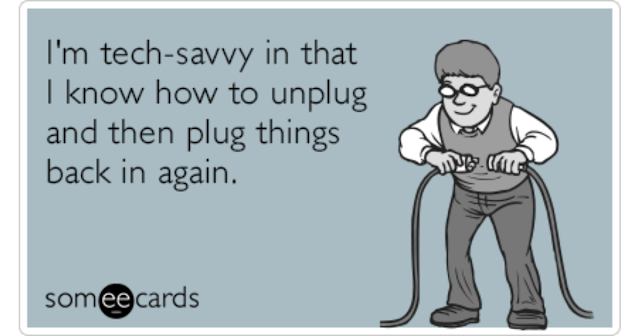 I want to start this post by saying that I'm by no means a blogging expert. :) Please know I'm not at all saying that. But I get e-mails about this subject a lot and thought maybe a post would help a lot of newbies. I was there once so I totally get it. "How do I link-up with you?" "Is it okay if I link-up with you?" "Can I join your link-up?" "I blogged about the topic, but don't know what to do now Can you help?." All great questions and I was in your place at one time as well so I totally understand. Bloggers create link-ups hoping (and sometimes even praying) others will join them. A link-up is kind of like an invitation to join. At the bottom of the post on the hosts' page there should be a button of some sort that says, "Add your blog to the link-up". If you're reading a blog that just participates in a link-up then the button won't be on their page. You have to click over to a hosts' page. If you want to join the link-up then you'd click "Add your blog to the link-up" to add your blog's information. It really is easy. *It's nice to link back to the people hosting the link-up. For example, when you state who you're linking up to just add their link. *It's also a great way to find new blogs to read and potentially some new blogger friends to collaborate with. Friday Favorites-every Friday Narci, Andrea, and I invite you to blog your favorites. It can be anything-favorite moments of the week, favorite books, favorite outfit, favorite thing you read. We'd love for you to join us! Workin' It-Once a month, Shay and I are trading in our deserted island for us to share how we "work it" in real life. From spring cleaning to holiday sanity, we'll be sharing it. The second Wednesday of every month we invite you to join us. 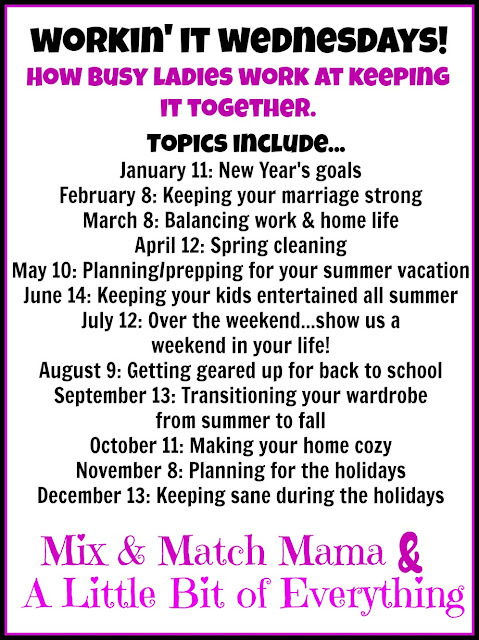 These are the monthly topics for the link-up. Andrea and I have a fun new link-up planned for the last Monday of the month. We'll be sharing more soon. She's putting the finishing touches on the graphic and then we'll let you know the details. If you're like me, it's easier if you see it all written down. 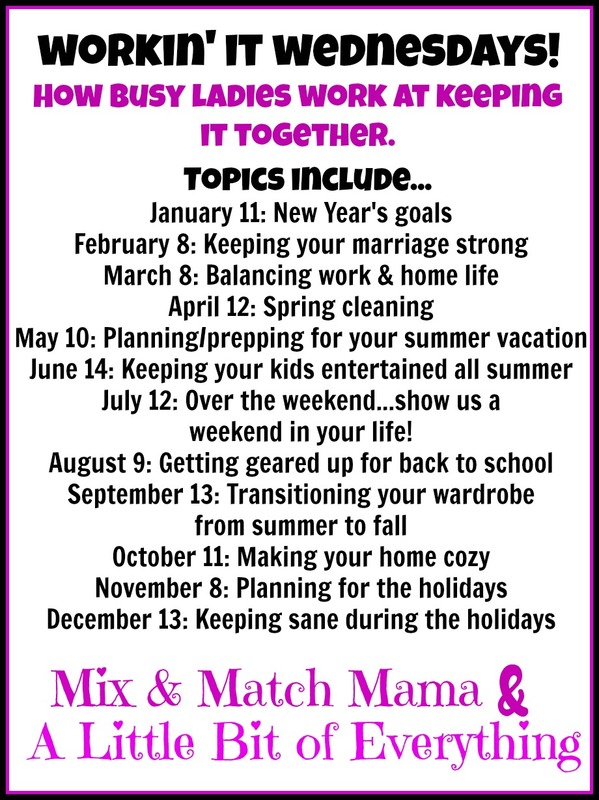 I recommend choosing several, getting them on your calendar, and linking-up this year! I can't keep track of all the link-ups going on, but I'd LOVE for you to share a link-up you host in the comments. Then all of us planning for the new year can add some new link-ups to the calendar. Yes! I get these questions too! I'm glad you addressed the answers today. The Friday Favorite link up is my very favorite of yours and I'm super pumped to start our new one next week!!! Oh I am super excited about the workin' it series!! Great idea!! I liked LINK UP 101! Thank you! It'll be a fun year! Hahaha! Thanks! When you first begin there are so many questions. Right? Hope this helps. This Is Very Helpful INFO For newbies. I don't blog but I've often wondered what it entails... Time commitment etc. Great information! I love our Friday Favorites link up, and I can't wait to linkup with Workin it Wednesday next week! So fun! Link ups are my favorite ! I'm hoping it helped. :). Thank you! Love love love link-ups! Working It sounds like a fun new idea. Happy linking! I host a Monday linkup, simply titled, hello Monday. This was perfect timing!! I am just starting a blog and trying to learn the ropes. Thank you so much for this! Okay! I've never linked up :) before... I'm going to give this a shot!! Writing these on my calendar now! I love linkups and have met such fun people and visit their blogs regularly now! I host 10 on the 10th - this month is 10 random facts about you on January 10th!!!! Love your blog! I love link-ups! :) Is the What's Up Wednesday? link-up not going to be happening this year? Amy...Yes! That link-up is happening. I just don't host it so I didn't share. Thanks for asking though! I'll be linking up with Sheaffer, Shay, and Mel the last Wednesday of the month.